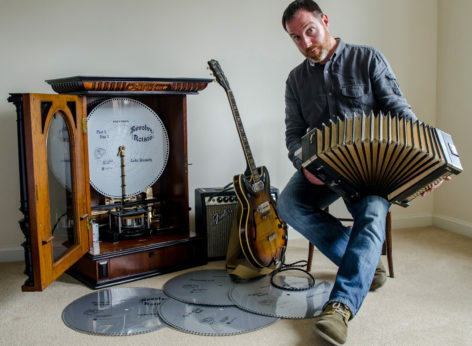 This year award-winning singer and composer Luke Daniels performed at Celtic Connections Festival and played an official showcase at the US Folk Alliance Conference in Kansas City. His past work as a member of the Riverdance Orchestra or with Cara Dillon sets his pedigree at the very highest level and promises a night of beautifully crafted acoustic songs and intriguing instrumental music. Luke has designed and built a brand new musical instrument for his latest show called the ‘Electrophon.’ It combines Victorian clockwork engineering on disc-playing polyphon music boxes with digital audio to perform live music as “continuous versus quantum sound” via 20” steel discs that have been specially made for the show.